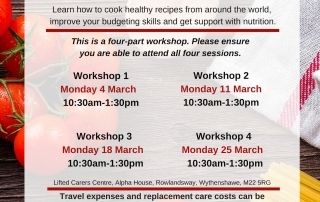 With this workshop for carers, you can learn how to cook healthy recipes from around the world, improve your budgeting skills and get support with nutrition. 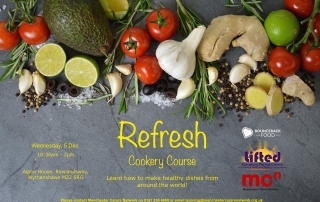 Learn how to make healthy meals from scratch on this free cookery course exclusively for carers! All necessary ingredients/equipment are provided and no previous cooking experience is required. Would you like to learn how to cook healthy meals from scratch? Do you want information and advice from a registered nutritionist? … Then this workshop is for you!